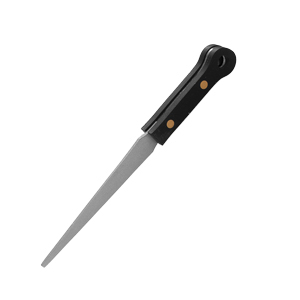 Diamond file tapered mini 3" 76mm. 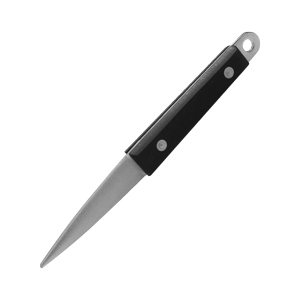 A versatile 3"half round/flat mini tapered file suitable for woodworking, gardening & domestic tooling. Handle 7/16" thick by 2 1/2" long. Diamond file tapered 3" 76mm A versatile 3" half round/flat tapered file suitable for woodworking, gardening & domestic tooling. Handle 1/2" thick by 2 1/2" long. 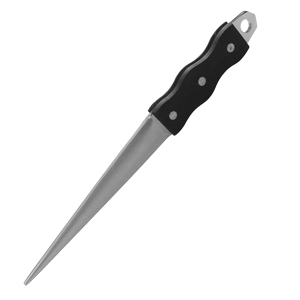 Diamond tapered file 6" 152mm The most unique versatile half round / flat tapered file suitable for woodworking, gardening & domestic tooling. Handle 17/32" thick by 3 9/16" long. 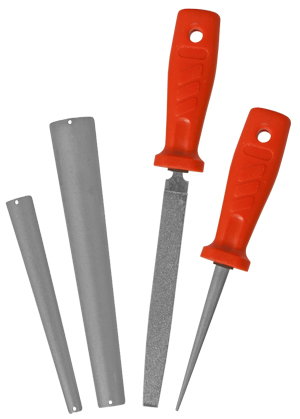 Sharpen your chisels and turning tools with the 4 pc diamond sharpening set. This set will sharpen tool steel, high speed steel and even carbide edged tools. The diamond surface does not require heavy pressure to produce smooth, quick results. The cone shaped sharpeners are great for honing curved or contoured tools like lathe turning tools and curved carving chisels.